The latest FipeZap survey shows Brazilian residential real estate prices registering a nominal increase after almost two years, while commercial real estate continue its downward decline. RIO DE JANEIRO, BRAZIL – According to the latest FipeZap Index, average residential rental prices in Brazil had a nominal increase of 0.17 percent in January 2017, not including inflation. This is the first increase the Index has registered in nearly twenty months. For the first time in almost two years, Brazil’s residential real estate prices showed a slight increase, photo Wikimedia Creative Commons. As expected, to kick off 2017 both Rio de Janeiro and São Paulo led the ranking of cities with the most expensive residential rental prices per square meter (R$35 each), followed by the Distrito Federal (R$29). The cities with cheapest rental prices were Goiânia (R$15), Curitiba (R$16) and Fortaleza (R$17). The latest FipeZap Rental Index included fifteen cities across Brazil which included, aside from those already mentioned, Santos, Recife, Niteroi, Florianopolis, Campinas, Porto Alegre, Belo Horizonte, Salvador, and São Bernardo do Campo. The average rental price per square meter across the fifteen cities surveyed in January 2017 was R$29. Despite the slight increase registered from December 2016 to January 2017, when compared to January 2016, the FipeZap Rental Index shows a decrease of 2.9 percent. Considering official inflation measured by the Broad Consumer Price Index (IPCA) of 5.35 percent during this twelve-month period, the average rental price fell by 7.84 percent during this period. On the commercial side, the FipeZap Commercial Index showed commercial real estate prices continuing to decline in 2017 with sale prices per square meter falling 0.29 percent and rental prices dropping 0.35 percent from December 2016 to January 2017. In January, the average price per square meter across the country for commercial sales and rentals was R$10,087 and R$43 respectively. As in the residential sector, Rio de Janeiro registered the highest commercial sale prices with R$11,240 per square meter. 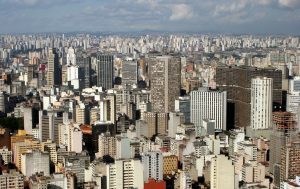 On the commercial rental side, São Paulo surpassed the Cidade Maravilhosa with an average commercial rental price of R$46 per square meter. The calculation of the FipeZap index considers prices from advertisements for new rents, without incorporating the correction in current contracts, whose prices are usually readjusted by the IGP-M/FGV or similar indexes according to the established contracts.